Diesel and Petrol Car Ban from 2040 - Time to Think about Electric? It was announced in July that in a bid to improve air pollution, new diesel and petrol cars and vans will be banned in the UK from 2040. So if you’re in the market for a used car, is this the time to think about purchasing an electric vehicle? 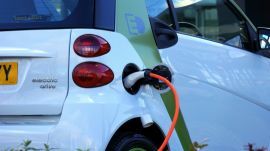 Industry expert David Bailey predicts: ‘A switch-over to electric cars would likely come in the mid-2020s when electric cars would out-compete petrol and diesel ones on factors like cost.’ So it will likely be a slow changeover from petrol and diesel to more environmentally friendly options, giving buyers plenty of time to adjust. With a limited choice of electric, hybrid and plug in hybrid vehicles available right now, they’re not the right choice for everyone, however with the changes taking place, it is certainly something worth considering when looking to purchase a used car. Whether an electric car could be economical for you will depending largely on your lifestyle, commute and access to electric charging points. Could an electric vehicle be right for you? Find out more about the different types of electric car on the market. Browse Hybrid and Plug In Hybrid (PHEV) vehicles currently in stock at Imperial Cars.